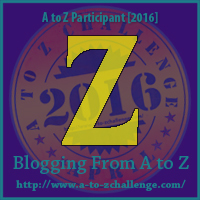 This is the last post for our 2016 A to Z Challenge. I’ve enjoyed posting every day about writing, coaching and inspiration. I hope I’ve shared something you’ve found interesting, and that you’ve felt encouraged. Today Z is for Zillions. Those zillions of things we should know and ask about this business we’re in: about publishing, publishers, agents and editors (including freelance editors), and even writing coaches. We should always ask what’s required of us, if there’s cost involved, what rights a publisher is buying and what happens to those rights if and when our books go out of print. There are a lot of horror stories out there; most of them are true. If we’re joining others in an anthology of any kind—short stories or novellas—we should ask those same questions: know what’s required of you financially, due dates, who the freelance editor will be, cover designer and how the royalties will be disbursed. Will there be a discount on author copies? Someone has to be in charge so find out who. There are questions we should ask that we might not even think of, like, “How do you spell your name?” At book signings, when we’re autographing our first book, we should always ask how to spell the person’s name, no matter how simple it sounds. It might be Ann, Anne or Ayn. How many different ways can you spell Jamie? How about Marianne, Marianna, Maryann, and Mary Anne? I’ve ruined a few books. Some authors just mark it out and start over in the same book. Not me. I couldn’t! So yes, I had to pay for my own book because it belonged to the bookstore. Be aware that when you have readers around you, clamoring for a book or to ask a question, you will stop thinking. Adrenalin is pumping. You’re selling books! I bought three copies (gifts) of the same book from an author once and because he was surrounded by his fans he didn’t ask me who all the books were for; he autographed all three books to me! Now does that make sense? Neither one of us were thinking! Dumb things will happen so be aware and try to minimize them. Make note: if your bookstore runs out of your books during a signing but customers are still lining up to buy you (and you just happen to have twenty more books in your car) don’t just hand them over to the bookstore manager. These are YOUR books. If they insist on handling the transactions (and they probably will) make certain you have an understanding in writing how many books you are putting them in charge of and that you will get your $$$ before you leave the store. I wasn’t too bright when this happened to me. See what I mean. Zillions of questions about this business! Zillions of answers! One question we often have is about money, how much we’re likely to make from __ __ publisher. It may not be important to you on that first book, but it will become important to you. That’s a promise. 🙂 Writing is hard work and no one wants to write for FREE. Make note: It’s not cool to ask other writers what they make, in fact, it’s considered in very bad taste. Only newbies/amateurs/uncool people do that. We don’t ask brain surgeons what they make. We don’t even ask house painters! But there is an author who’s asking because she wants all writers to be informed so they can make wise decisions regarding their careers. Brenda Hiatt collects and shares data on author earnings from various publishers. The only way for her to do that is if we fill out her publishing survey. We do it anonymously so if you have a publisher, please go to her website and fill out the info. Here’s the link for you to check publishers. Her information was last updated in early 2015. Do you have questions that need answers? I don’t know everything but I enjoy trying to find answers. Feel free to email me privately at jessyferguson (at) gmail (dot) com if you don’t want to post your questions below. And thanks so much for following my A to Z Challenge. You’ve made it all worthwhile! Thank you for a wonderful and inspirational theme. I enjoyed your posts and learned a lot here at your blog. Congrats on reaching the finishing line. Great advice. It’s hard to think on the spot somethings. Glad to know there is a data base for some of those questions. You need to know what other people are getting for their books, etc. It’s like real estate. It can vary from place to place. The last signing I did, I was so intent on writing a note to everyone and get their names spelled right, that I actually forgot to “Sign” some of the books. You gave good advice here about asking how to spell people’s names. You are right, so many variants for even common names. Sounds like you had a great theme for the challenge and congrats on finishing it!